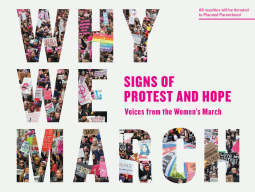 Synopsis: Celebrate the Women’s March with this inspiring collection of 500 images of the most powerful, uplifting, clever, and creative protest signs carried by marchers across the United States and around the world. Organized thematically, the photographs in Why We March--featuring messages about reproductive rights and immigration, cabinet picks and police violence, climate change, and feminism--together paint a striking portrait of the hope, defiance, anger, and passion that sent more than 5 million people into the streets to protest. “Women’s Rights = Human Rights.” “Love Trumps Hate.” “Nasty Women Unite.” “Build Bridges, Not Walls.” These messages are a rallying cry for this burgeoning movement, and this collection will serve as both a valuable encapsulation of this unprecedented moment in political history and a powerful reminder of why we march. All royalties from the sale of this book will be donated to Planned Parenthood. Review: I marched in Trenton, NJ and one of the highlights of the march were the creative signs. My own pictures from the day are mostly of the signs I saw. This book is a collection of signs from a lot of the larger marches around the world. The book also includes a handful of quotes from some of the speeches from the March on Washington. I wish there had been a few more quotes and I would have liked to see pictures from more marches. I recommend buying the book and just leaving it out in your house. The cover makes a statement and invites people to pick it up and flip through. Each photo and quote explains why we marched that day and why we will continue to march.